My own recipe. 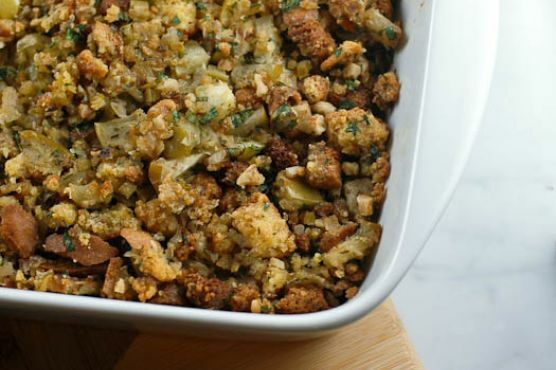 This makes A LOT of stuffing -- 12 to 14 servings. If you have a lot of leftovers, use it to make my Thanksgiving Leftovers Breakfast Casserole. Melt the butter in a skillet. Add chopped celery and onions and cook over medium heat about 5 minutes. Crumble the sausage and add it to the skillet. Continue cooking over medium heat stirring the ingredients until the sausage is lightly browned. Transfer the ingredients to a large mixing bowl. Add all of the remaining ingredients to the mixing bowl except the chicken stock. Gently combine all of the ingredients. Pour the above ingredients into a large buttered casserole dish. (This makes so much that I purchase a throw-away aluminum pan). Pour the chicken stock over the stuffing and place it in a preheated 325 degree oven.